This post is all about the photograph. Well, not really the photograph but the subjects. The photographer forgot to remove the fingerprint-smeared protective lens filter, but the strong spirit of the subjects shines through the haze. 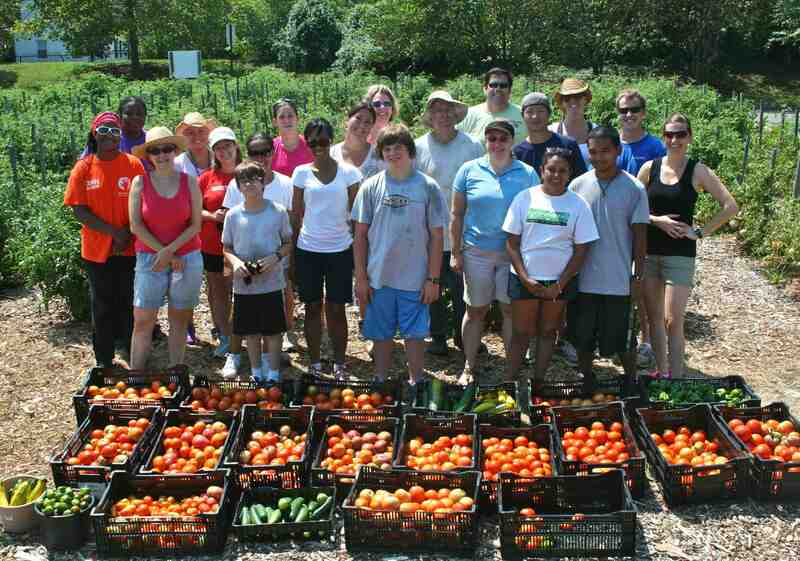 What a great group of people, brought together in the Lewis Ginter Community Kitchen Garden on Saturday, August 4. As you can see, there’s a mix of soil & perspiration, but this group is still smiling after three hours of volunteer garden labor in 90 degree Richmond summer heat. That’s the Wow factor. It’s not the more than 500 pounds of zucchini, bell peppers, cucumbers and tomatoes, tomatoes, tomatoes harvested to benefit FeedMore’s Community Kitchen. 21 volunteers harvested more than 500 pounds of fresh produce for FeedMore’s Community Kitchen.